Boris Yeltsin's complicated relationship with the idea of freedom led him to enact laws guaranteeing personal rights, but crack down on those who opposed his rule. The end of 2011 will mark the 20th anniversary of the fall of the Soviet Union. It is almost impossible to overstate the significance of this event, even if the changes brought about by the dissolution of the world’s biggest country did not satisfy everyone. The year's milestones began with commemorations around what would have been the 80th birthday of Boris Yeltsin--the first president of the Russian Federation and the man who oversaw the country's difficult transition from communism to capitalism. A huge monument has been erected to Yeltsin in his native city, Ekaterinburg; there is a new biography coming out; a series of conferences with the biggest political figures of the 1990s will be held; as well as concerts at the Bolshoi Theater, and even a rock concert. “The level of freedom was significantly higher under the Yeltsin government than nowadays. Boris Yeltsin was, in my opinion, a fearless man, so he had no need for instruments for spreading fear,” said Matthias Schepp, the Moscow bureau chief of German magazine Der Spiegel. President Dmitry Medvedev also recently spoke in praise of Yeltsin. “Russia should be grateful to Yeltsin, because during this extremely difficult period, the country did not deviate from the path of change, it implemented radical transformations, and is now moving forward,” Medvedev said during the inauguration of the giant marble monument in Ekaterinburg. Medvedev also contributed an introduction to a new biography of Yeltsin by Rudolf Pikhoya. “Yeltsin, more than any other Soviet politician, valued popular support. When the social and economic crisis broke out in the country, he began giving speeches to the people, trying to create the same social support and somehow change the traditional system of relations between power and society,” Pikhoya said. After building his reputation, and political career, as a populist in the Urals, Yeltsin was appointed mayor of Moscow by Mikhail Gorbachev in 1985. He held this position until 1987, when he began publicly criticizing the president and the Politburo and was removed from his office. The Communist campaign against Yeltsin and subsequent discussion of his alcoholism did not prevent his reelection to the Duma in 1989 and, in 1990, as president of the Supreme Soviet of the Socialist Republic of the Russian Federation. Despite his differences with Gorbachev, during the attempted 1991 Putsch, Yeltsin put an end to the maneuvers by speaking while standing on a tank in front of the parliament building. Later that year, Yeltsin was elected the president of the Soviet Union with 57 percent of the vote and initiated a series of reforms that culminated in the creation of a free market and a more free society in general. Despite this law, however, there is no such freedom in Russia today and in Moscow, activists gather on every 31st day of the month to claim their right to assemble. For human rights activist Lyudmila Alekseyeva, the lack of democratic and liberal traditions have hampered the continued process of reform. “Unfortunately, not only freedom emerged in those years, but also tremendous trials," said Alekseyeva, speaking about the turbulent 1990s. "A huge country collapsed; not only its political structure, but also its economy and social structure, and people found themselves living under new conditions, in a new state. The planned economy and free market proved absolutely incapable of facing this trial so, for many people, memories of freedom are coupled up memories of difficulties and privations." 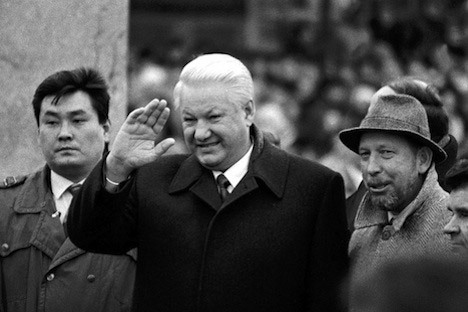 Although Yeltsin the politician is linked to the establishment of several freedoms, he is also tied to two distinct instances in which his personal autonomy infringed upon previously granted freedoms: One was the use of military force against the masses protesting in front of the parliament building in October 1993; the other was the launch of the first war in Chechnya, which can be seen as an attempt to impede the independence of other republics within Russia. “I always feel irritated when it is said that Gorbachev gave us freedom or that Yeltsin gave us freedom," said political analyst Gleb Pavlovsky, who protested against the privatization plans carried out by Anatoly Chubais during the Yeltsin Era. “I have a complicated attitude towards Yeltsin, but I believe it did not cross his mind to think of freedoms as institutions. The only thing that remains in the people’s minds is the shootout in the parliament--and that is imprinted more deeply than the Constitution,” he said.